Once again we are unleashing Adventurethon Demolish in the Clarence Valley region in NSW, 23rd & 24th November 2019. The 2017 and 2018 events were well received and provided participants and spectators with a truly memorable experience amongst some spectacular scenery. Gorge swims were a real highlight of the run stage in 2018 due to the hot conditions and these will again feature in 2019. We are hoping to announce another major ‘fun’ element into the run this year, stay tuned for news on that. The Clarence River turned on beautiful water for a fast and scenic paddle last year with a few fun rapids to spike adrenalin levels. Rumour has it that some competitors went back to repeat some rapids during the race because it was such good fun! The weekend will conclude with the mountain bike stage on the fast and flowing Bom Bom trails. No big climbs here, just crank up the small slopes and let rip down the other sides for a big dose of sweet fun. As with all Adventurethon events we aim to cater for all skill levels in all the different disciplines, paddling, trail running and mountain biking so there is a discipline, distance, and technical level appropriate to you. Event details on the following pages describe the 2018 event. They will provide you with a basis for planning your participation but please be aware that there may be changes to specific details for this year. Keep up with our news and visit back shortly. We will be releasing up to date event details soon! For some time we have wanted to put on an event with every leg being a stunner in its’ own right, with no need to compromise on quality. We often found that there were people who would love to do 1 discipline but not all of them and that finding teammates was kind of a hard process if they weren’t already part of the multisport circles. Hence the evolution of the Adventurethon Demolish Format onto the scene. Demolish is essentially an Adventurethon event which has been pulled apart to create 3 stand alone individual races, with times that can be tallied together in a stage race format at the end to find an overall champion. However, it can also can be raced as a team, in pairs, or simply just attempt your favourite leg. 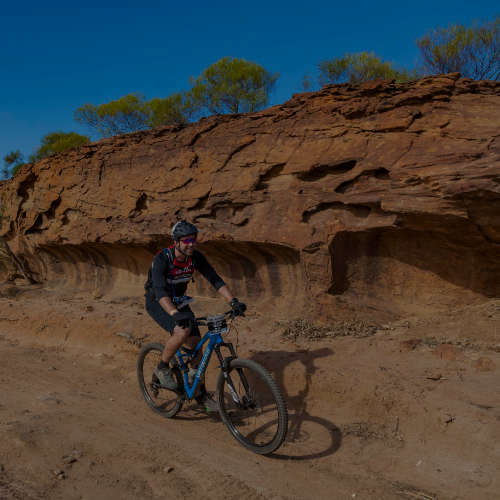 The Clarence Valley event will feature an amazing tour of the area taking in some challenging but fun mountain biking, adventure running and paddling over 2 days. Bring your family and mates and settle in for some great camping and entertainment with seriously easy logistics and a warm, country atmosphere at the heart of the weekend. “Having travelled a lot of the country I must say I was completely blown away with the Clarence Valley and the hardest bit has been trying to figure out what not to include… the area really has some amazing scenery and I actually felt like I was out of the country with no beach in sight and great water flow through the rivers, amazing Gorges on the run, and a stunning mountain biking area. It was hard to think I was only 3 and a bit hours south of Brissy at times”. We can’t wait to be sitting around the fire at the Gorge Campsite with you all – Chatting about the amazing adventure run course you made it through earlier or how you tried your first go at rapids and flowing water and are now hooked. You can forget about all the stresses and routines of life and completely lose yourself in the adventure of this paddle. It is quite an isolated / remote / Wilderness paddle – so you won’t see any roads till the finish line. This is the perfect opportunity for an ocean paddler to try their first rapids race. There are deep pools followed by adrenaline producing shallow gravel races at each of the grade 1 and 2 rapids. This paddle is great even when river levels are low as its mainly the speed of the gravel races that change. In low river levels we sat in a couple of the rapids with no paddling and recorded 12 kph based on the speed of the rapids alone. A gravel race is one of the least technical features where the river narrows and water shoots down faster without major large rocks or features to avoid. These Gravel races are fun to run because you simply aim the nose down into the moving water (aiming for the bumpiest [read fastest] water surface) and all will be fine. A couple of the rapids have easier slower and less obstructed lines as well as faster but riskier lines which will be marked for your ease come event weekend. Hot tip! switch out that Ocean rudder for something much smaller and preferably a trailing rudder. The Gravel races get around 3 to 4 inches deep in sections so its just smart to avoid the risk and fit a kick up rudder or similar. OR by an Old tk1, or racing k1 you can bash around a bit perhaps fit a light spray skirt to avoid splashes of water getting in. Other options could include a plastic ski like a spirit racing ski, PRS or Fury or if you want a custom Ski for the Job Grafton Paddle sports has a few tried and true boats that have won events of this nature before. This course can be completed as an individual or as a double. Deep pools followed by shallow gravel races make for a rush of adrenaline at each of the grade 1 and 2 rapids. This paddle is great even when river levels are low as its mainly the speed of the gravel races that change. Even in low river levels you will achieve speeds of 12 kph without paddling in the gravel races. Gravel races are relatively simple to run so provide an ideal place to get started in down river events without major risks to life or boat. A couple of the rapids have easier slower and less obstructed lines as well as faster but riskier lines which will be mentioned for your ease come event weekend. This is the perfect opportunity for an ocean paddler or flat water paddler to try their first rapids race and a flatwater paddler to get a bit of a thrill. Complete the course as an individual or double. If you are new to the sport, have children who want to get involved or paddling isn’t your best leg, but you still want to give it a go then this is for you. 2 km is a perfect distance to have a bit of fun, and push yourself, but not need all of the endurance and technical skill of the ULTRA & ENDURO options. Expect it to take between 15 & 25 minutes for most paddlers. All forms of kayaks welcomed here from wide sit on plastics to sleek river and ocean racers, there are no rapids in this race so a surf rudder will be fine to use. However keep tabs on the river depths as certain lines are better than others. Registrations are NOW OPEN so get training and start planning the weekend away. Completely escape the “same-same” of regular trail running and become magically absorbed in the adventure experience as you run along the edge of the Clarence Valley Gorge, through cattle tracks, water crossings, rock scrambles and so much more. Our Taste / Junior (short) course turns and crosses the Gorge early and allows a safe crossing amongst the pools, with the gentle sound of rapids and waterfalls close by. The ENDURO (medium) run takes you further upstream than the Taste / Junior course to a safe crossing point before diverging from the ultra course and returning through different country for a real adventure. 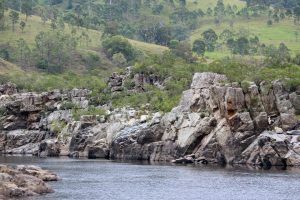 The ULTRA (long) course continues beyond the Enduro turn along the edge of the Clarence River to the Gorge property boundary before returning and crossing the river and taking in the bulk of the amazing Gorge waterfalls and rapids from the rocks that line its edges. This Adventure run has a couple of safe sections to cross the river with rope crossings and signage in a few areas. The run leg begins along cattle tracks that dance with the edge of the Clarence River and the edge of the gorge a few times early in the piece, with sections veering higher in the landscape and through different vegetation and crossing small creeks and wetlands. After the cattle track you will turn to the edge of the river and follow the rocks along to a course junction where the medium (Enduro) course diverges right to cross the river. The medium (Enduro) course turns and crosses the Gorge early. the longer Ultra course continues much further upstream along the river’s edge (to the Gorge property border) before coming back and crossing the river and taking in the bulk of the amazing Gorge waterfalls and rapids from the rocks that line its edges. 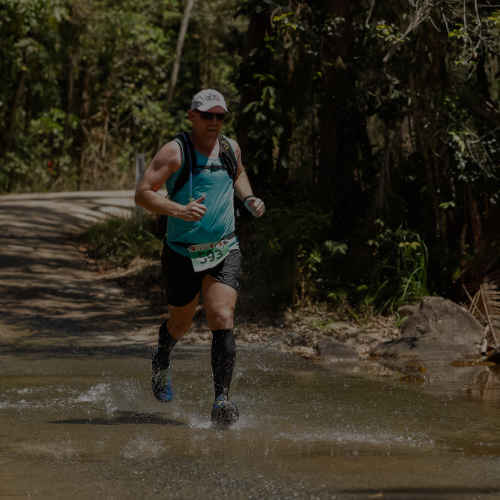 The ENDURO (medium) run leg begins along cattle tracks that dance with the edge of the Clarence River and the edge of the gorge early in the piece, with sections veering higher in the landscape and through different vegetation and crossing a few small creeks and wetlands. After the cattle track you will turn to the edge of the river and follow the rocks along to a course junction where the Enduro (medium) course diverges right to cross the river (the Ultra course continues further upstream from here). There will be plenty of markings to show this track divergence through to a safe crossing amongst the pools with the gentle sound of rapids and waterfalls close by. The longer (Uutra) course will continue much further upstream along the edge of the Clarence River. There are options to suit your preferences with Ultra (45km), Enduro (22.5km) and Taste/Junior (12km), so be sure to bring the whole family and make a weekend of it. The ULTRA mountain bike course covers TWO LAPS of the Enduro course and is for the seasoned rider, or one who just wants to get out and have a good crack at a great course. 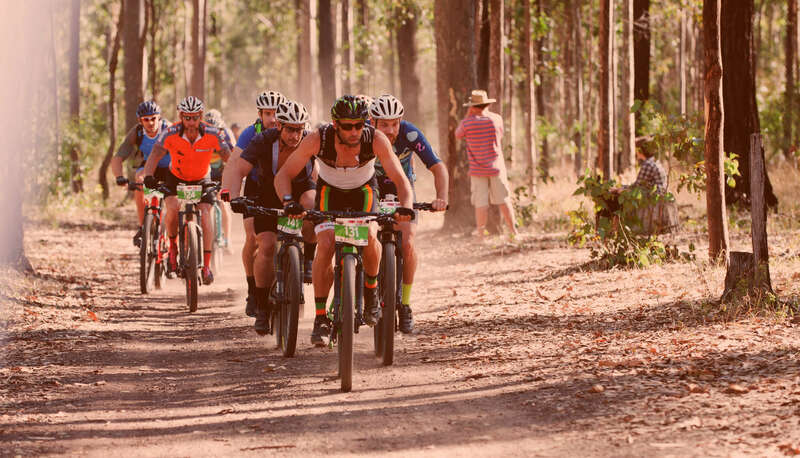 The MTB stage has kilometres of well-built single-track that winds its way through the Bom Bom State Forest. There are sections of really unique riding in addition to some exciting dirt jumps (which makes for heaps of fun). Skilled riders will find they are able to navigate the course faster and can take A line options for extra fun and some race specific benefit. Beginners can feel confident in that there are B line options for many of the features. This mountain bike course has kilometres of well-built single-track that winds its way through the Bom Bom state Forest. There are sections of really unique riding in addition to some exciting dirt jumps (which makes for heaps of fun). Skilled riders will find they are able to take the course faster and can take A line options for extra fun and some race specific benefit. Beginners can feel confident in that there are B line options for many of the features. If you are new to the sport, have children to who want to get involved or mountain bike riding isn’t your best leg, but you still want to give it a go then this is for you. 12km is a perfect distance to have a bit of fun, and push yourself, but not need all of the endurance and technical skill of the ULTRA & ENDURO options. Adventurethon Demolish has 3 different stages for you to choose from. PADDLE, &/or RUN, &/or RIDE. The beauty of the DEMOLISH format is the opportunity to choose JUST 1 discipline. So if you are an avid Mountain biker and can’t paddle, or find it hard to get a team – this is perfect for you. You can choose to do JUST 1 Stage (or 2 stages) or complete the ULTIMATE DEMOLISH (which is all 3 stages). It really is up to YOU, and your preferences. There are also multiple distances to choose from in each of the stages. All races will be in the Clarence Valley region over the weekend of 1st & 2nd December. We have allowed sufficient time between races to allow you to easily transfer between race locations if you wish to compete in multiple stages or to spectate and see what great fun the competitors are having in the other disciplines. Please be sure to read the entire checklist below as there are mandatory items on the checklist which you will need to make sure you have before race day. There will be mandatory gear checks on course and you will be pulled out of the race if you are missing any mandatory gear. Let us know if you have any questions. This is the full checklist for those doing all three disciplines, however, if you are doing one or two stages please go through each relevant list to ensure you have what you need. We like to ensure our competitors always have a comfortable and relaxing home to settle into & at the same time have a fun trip, this event is great in that our home will be a camping area where we can all enjoy each others company and remove the distraction of electronic devices, phone calls and facebook notifications ! yeeha ! Pre race safety and logistics briefing and race pack pick up are on Friday 30th November at Copmanhurst riverbank HQ (Rest Point Family Hotel: 59 Grafton St, Copmanhurst) from 5:30 pm. Camping is available on Saturday 1st at The Gorge (after the run leg) and is charged at $22 per car load of people. Enjoy a special camping area allocated right near the Run event start/ finish area so we can enjoy some time mingling before and after the event. The area has toilets and bins onsite and is BYO toilet paper and everything else (as it’s quite remote). The Dirt road to access The Gorge requires a little bit of clearance. We took a few vehicles out on our reccy trips and although a VW golf made it all the way to the campsites its hardly the best choice if you have access to a slightly beefier vehicle with more clearance for dirt roads and puddles / should there be rain leading into the event. Sometimes with rain there is a small river crossing which requires a bit of clearance any standard 4wd will easily get through…some sedans also. Camping trailers/ caravans/ campervans are welcomed on site. This area is perfect stay over for those wanting to do the run event and with travel times all sorted and a late start for the MTB the next day you will find it easy to get to the start line of the MTB the next morning. Limited campsites available. Pre-book now! If you need to Hire a car we suggest you consider clearance when driving on dirt roads, as well as having to potentially cross a puddle or 2. The dirt road to The Gorge requires a little bit of clearance. We took a few vehicles out last year and although a VW golf made it all the way to the campsites, it’s hardly the best choice; if you have access to a slightly beefier vehicle with more clearance for dirt roads and puddles should there be rain leading into the event. Sometimes with rain there is a small river crossing which requires a bit of clearance any standard 4wd will easily get through…some sedans also. Athletes competing in the Ultra/long and Enduro/Medium Clarence River Rush paddle transport is on offer. Athlete are to drop off Kayaks at starting line and drive to the finish line. Here a bus (MUST BOOK) will pick athletes up and drop back to starting line therefore cars are parked at the final destination. There are 2 time slots available, 6:10 am, 7:00 am (Ultra/Enduro). You will need to book and preference will be given to those without a support crew. You will need to provide your own equipment for each stage of the race. Kayaks both individual and double are available for hire. Click here and select your kayak, then choose whether to add a paddle and/or pfd. If you don’t see what you are after in this list, please email Joel at info@adventurethon.com.au along with your particular kayak requirements so we can endeavor to locate an appropriate craft for you. Or you might decide to have a look around and come back on another adventure, perhaps finding some more advanced sections of river further upstream on the Mighty Clarence Canoe and Kayak trail. Bike hire is available from John at CycleSport,135 Prince St, Grafton (https://www.cyclesportgrafton.com) and from Al at Ventoux Cycles, 27 Beach Road Coffs Harbour, info@ventouxcycles.com.au. Want to use your own equipment but travelling by air? Please email Joel at info@adventurethon.com.au along with your particular requirements so we can assist you in working out logistics of this.